The city’s program to incentivize affordable housing through property tax breaks is primarily a tax burden shift, not a revenue loss. That’s what the city’s Office of Housing has determined after analyzing its Multi-Family Tax Exemption Program. The program is often taken advantage of in so-called “workforce” developments on Capitol Hill. The City Council will hear a briefing on those findings during Wednesday’s council meeting. The voluntary MFTE program provides a property tax break to building owners for 12 years if they set aside at least 20% of their units for affordable housing.The briefing comes nearly a year after the OH launched an investigation to determine the nature of the program’s tax burden because of conflicting understandings of the program, According to the OH, the property tax exemptions did not reduce revenue, but rather shifted the tax burden to other taxpayers. Other agencies thought the exemption counted as a net loss. The tax burden for the majority of the exempted amount is shifted from tax-exempt taxpayers to other tax payers. A minority of the exempted amount is simply uncollected for the duration of the exemption. For 2013, the 51 active MFTE properties are exempt from $6.93 million in property tax. The City of Seattle’s share of this total is approximately $2.2 million. · Based on data provided by King County, in 2013 the City will not collect approximately $354,000 of this total. · The remainder will be collected, with tax burden shifted from building owners that provide rent-restricted units to other taxpayers. · A portion of the amount collected results from the impact of new construction on the City’s tax base. This amount ($726,000 in 2013) would not have been collected had the MFTE buildings not been constructed. The effectiveness of the MFTE program came into question in 2011 following reports on many shortcomings of the program, including that tax-breaks had been awarded to undeserving developers. The following year the city auditor published a report that recommended the Office of Housing implement stronger oversight and compliance measure for the program. Meanwhile, the committee will also be briefed on recommendations the city consider employing tools like “lease swaps” and “Eminent Domain strategy” to help create “local solutions for low-income homeowners and communities impacted by the foreclosure crisis.” You can read more about the recommendations from Cornell Law professor Robert Hockett in this briefing document (PDF). This entry was posted in News, etc. and tagged development by Bryan Cohen. Bookmark the permalink. Define “affordable housing.” It isn’t $1500 a month for a studio apartment. The City continues to allow developers to screw over entire neighborhoods while they line their pockets. 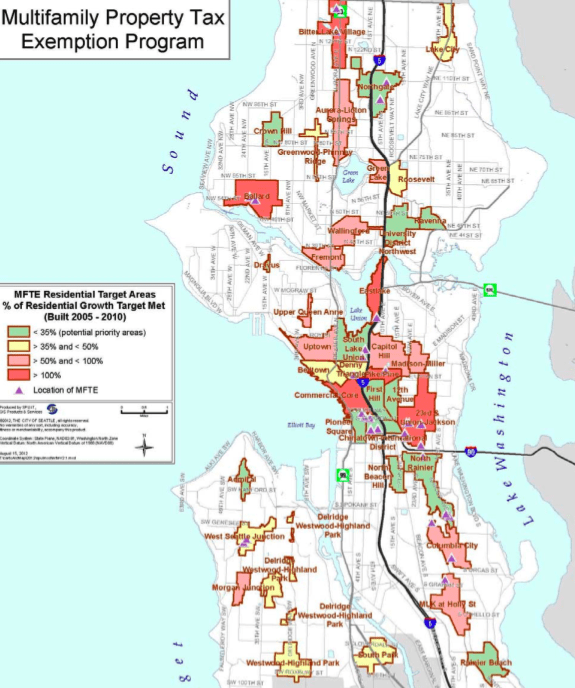 Coffee shop workers, students, bookstore workers, hair dressers….are they all destined to have to commute from Renton or Everett so Capitol Hill can be filled with overpriced “market rate” development with a Subway sandwich and dry cleaners on the ground floor of all these new buildings? The definition of “affordable housing” used by this program is very easy to find if you bothered to look. For 2013 the amount that can be charged for a studio is $986 a month (including utilities). If the renter is forced to pay utilities, the limit is $886 a month. While $900 a month may still be too high for most baristas, students, etc, your wild claims of $1,500 rents don’t help the conversation (and make you look like an idiot to those who are familiar with the program). Building closets, tubes and 100, 200 and 300 SQF cubes are not a solution. What exactly is the definition of affordable housing? How is it going to stay that way? The only thing that will being down rent is QUANTITY. Vacancies are what reduce rent. You need more housing, not smaller housing. Incentives should be given to utilize space more wisely. When a 4 or 6 story building or a 1,2,3 story house occupies a space where 10 times as many people could live something needs to change. To me it is selfish and mean to provide housing for a select few who can afford it.